Today: A simpler way to prepare asparagus, plus a clever dressing to put on all of your salads this season. I have learned not to question recipes that feature water as a main ingredient. I have also learned that when it comes to asparagus, we shouldn't question Melissa Hamilton and Christopher Hirsheimer, whose images of fat, vibrant stalks brighten my inbox nearly every day this time of year. 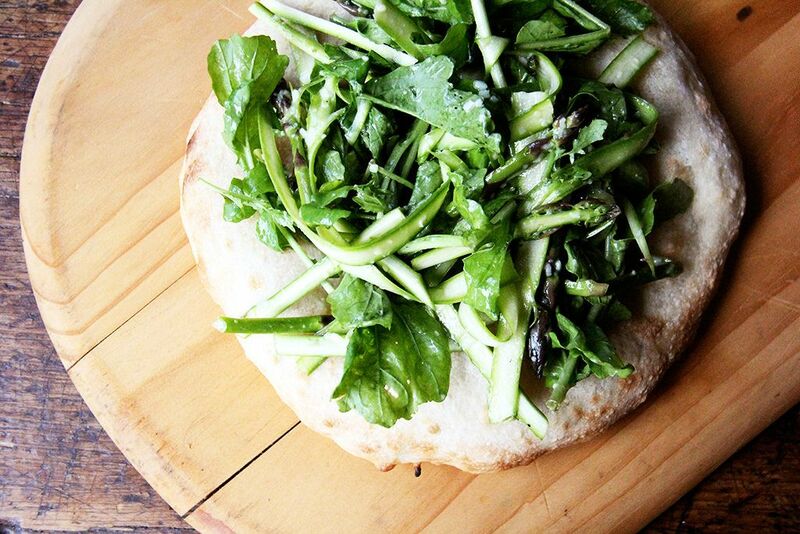 Which is why this shaved asparagus and arugula salad, from Canal House Cooks Every Day, suppressed my instincts to improvise. I did as directed: After finely grating Pecorino Romano cheese into a bowl, I poured boiling water over top—then I slowly whisked in olive oil until the dressing emulsified. Remarkably, it worked. When the boiling water hits the cheese, it creates a milky solution, which, like egg yolks in mayonnaise and mustard in vinaigrette, allows the water and oil to emulsify—at least briefly. The process feels similar to making a classic cacio e pepe, whose creamy sauce is a product of finely grated Pecorino and pasta cooking water. 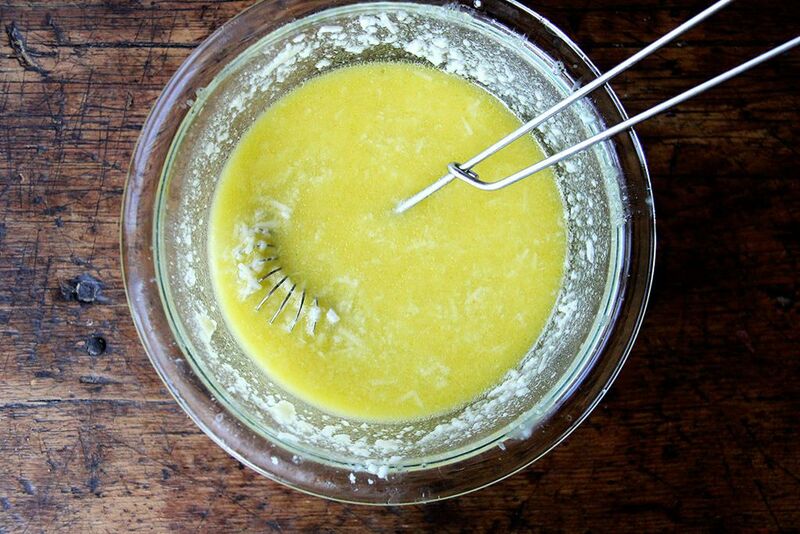 As this dressing sits, it both separates and thickens—but will re-emulsify upon stirring. 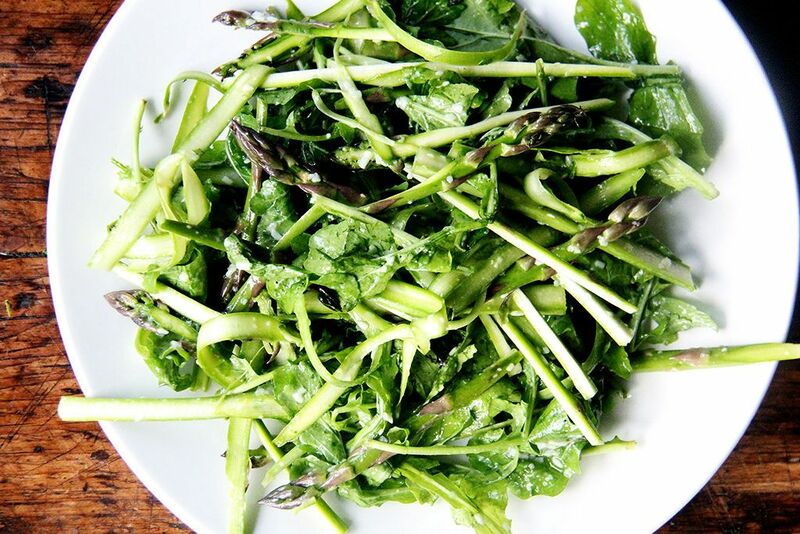 More surprising than this salad’s water-and-oil dressing, perhaps, is the absence of lemon—so often a nice match for sweet asparagus and spicy arugula. Here, while a squeeze of lemon wouldn’t do any harm, the Pecorino provides an acidity and sharpness that renders citrus unnecessary. I have been using this dressing with shaved asparagus alone or paired with arugula, but as the summer progresses, I anticipate tossing it with thinly sliced fennel, zucchini, summer squash, cauliflower, and broccoli. This salad makes a lovely side dish on its own, but can easily be turned into a meal: Simply heap it atop an enormous carbohydrate—pizza, flatbread, bruschetta. There’s no science behind that. Look for bright-colored, smooth-skinned, firm stalks with compact heads. Avoid spears with desiccated bottoms. Asparagus can be served raw, as described here, or steamed, boiled, sautéed, roasted, grilled, or deep fried. If you're harvesting the asparagus from a garden or buying from a farmers market, you may need to soak the spears in cold water to remove any dirt or grit clinging to them. Once clean, cut off the woody ends, and if you’re up for it, peel the skins with a vegetable peeler—removing the tough skins, the Canal House ladies insist, allows the spears to cook evenly. Most simply, asparagus spears can be plunged in boiling salted water, cooked until tender, then tossed with butter and herbs or roasted with olive oil, salt, and pepper at 425º F for 15 to 20 minutes or until just beginning to char. An absurdly addictive side dish: Render fat from pancetta, then sauté asparagus and leeks until crisp tender. Finish with garlic, lemon, and pine nuts. Serve immediately. Craig Claiborne's pasta con asparagi: Sauté asparagus, then toss with an unlikely (but genius) sequence of ingredients—canned, crushed tomatoes and beaten eggs. A vegetable panzanella: Sauté leeks with asparagus, then toss with toasted bread, pesto, peas, and snow peas. Topped with a couple of poached eggs, this is spring comfort food at its best. Pickled: Preserve the flavor of spring for months using a simply seasoned brine and a quick, refrigerator method. 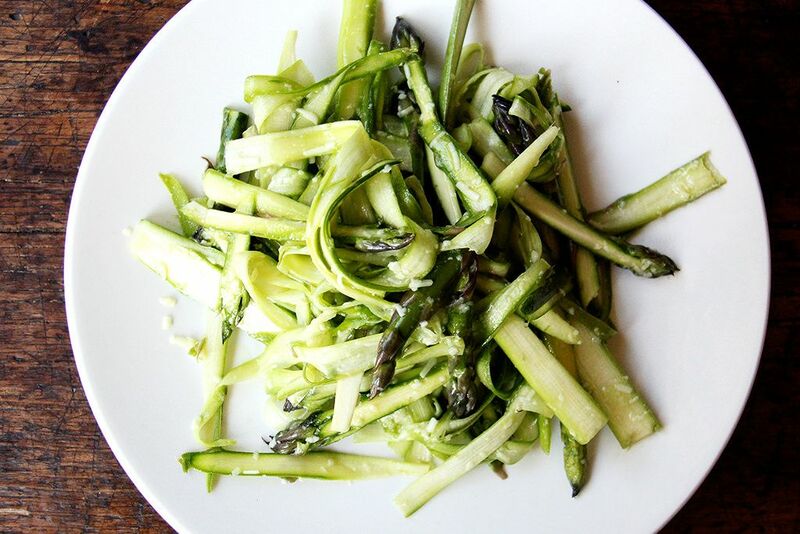 An exceptionally seasonal salad: Blanch spears for two minutes in salted water, then toss with sliced young garlic and grated fresh horseradish. Finish with olive oil, salt, and lemon. 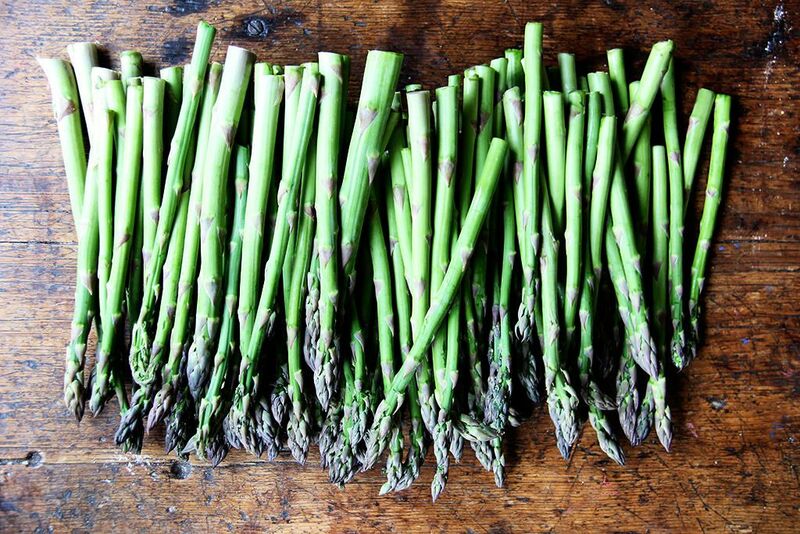 A five-ingredient braise: Combine asparagus with water, olive oil, rosemary, bay leaves, and salt, then cook for 8 to 10 minutes, or until the spears have soaked up all the liquid and are just beginning to brown. See full recipe (and save it and print it) here. EDITOR'S NOTE: This story originally ran in May 2015. We're republishing it today because, well, it's asparagus season! A recipe caught my eye last week on an Italian site for Asparagus Pesto. Must try to find it and try. And a topic to add to my ideas for coming blog posts! YES. And please report back. That sounds fantastic. No no no. Don't boil asparagus for 15 or 20 minutes! Oh dear, no. ALWAYS peel the white asparagus, green ones doesn't need to be peeled. Then cut off the woody ends. Cut them into half or three pieces if you want (no, it doesn't hurt the aparagus and it does not make you a barbarian!). Then bring enough water to the boil in a pan so that they are completely covered, ad some salt to the water, and, if you want to, 1 tablespoon of sugar and a little bit (one squirt) of lemonjuice. When the water boils, put the asparagus in, lid on the pan, let them boil on a medium heat for 5 minutes, and then switch the heat off, and if need be, remove the pan from the heatsource. Leaf the lid on, let them in for another 10 minutes. Then take them out and let rest for a few moments on a clean kitchentowel. Your asparagus will be boiled to perfection! I think you are mistaken about the instructions above re boiling — the 15-20 minutes was in reference to roasting not boiling. Your boiling method sounds like perfection! I will try that. 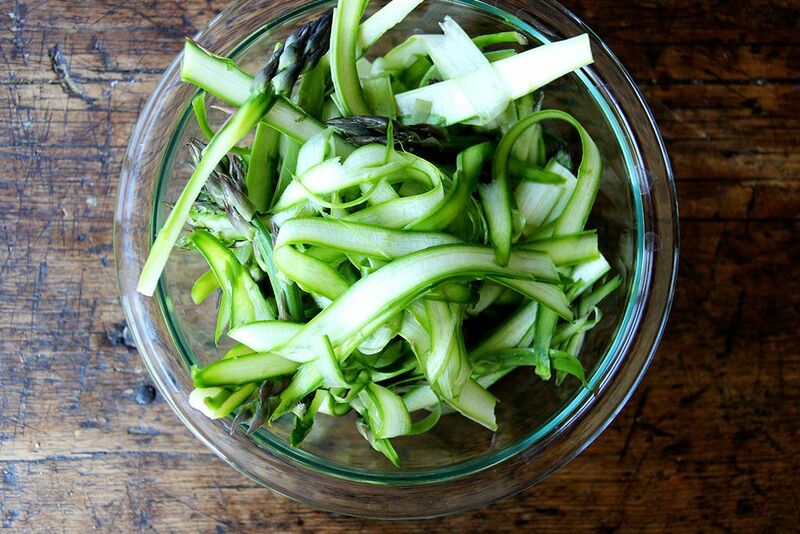 Looks amazing, I have a huge bunch of asparagus so I'm going to make this tonight! This sounds incredible and refreshing! We will definitely be trying it this summer!